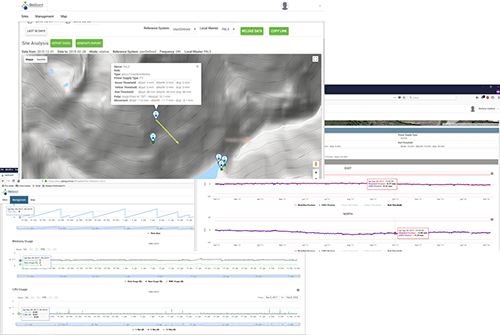 The GeoGuard Service includes hardware and activities specifically designed for the monitoring of the displacements and deformations of structures and ground on selected points, customized to different application scenarios, based on accurate price-competitive GNSS positioning with centimeter-level accuracy in near real-time, or millimeter-level accuracy for daily/sub-daily solutions. professional services: to design, build and manage customized solutions according to the customer business needs. By monitoring the absolute and relative displacements of carefully selected key points, it is possible to detect, quantify and characterize the various kinds of motions undergone by the structure. The monitoring update rate can be set from hourly to daily, depending on the needed level of precision. GeoGuard’s proprietary technology allows reaching high-precision monitoring results also in challenging environments. Tailored analysis tools allow to highlight and characterize site-specific and even element-specific motions within the general displacements undergone by the monitored structure. 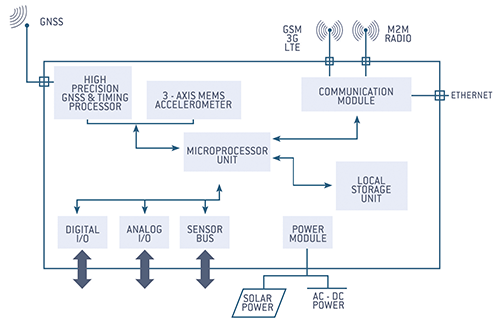 Our GNSS monitoring stations are designed to accommodate additional sensors via analog and digital interfaces, allowing to log and transmit their measurements together with GNSS ones. The GNSS-detected deformations can thus be correlated with other sensors measurements, providing a more comprehensive picture of the status of the monitored structure. A Geoguard Monitoring Unit (GMU) is a newly designed remote terminal unit, mainly based on price-competitive Global Navigation Satellite System (GNSS) sensor, specifically designed to operate in challenging environments. It can be powered in any location supporting AC, DC or solar power. GeoGuard Cloud can remotely manage the units via two-way communication. Power Module: it provides power supply by alternate current (AC) and direct current (DC) from different sources, including photovoltaic panels. GeoGuard Monitoring Units can create an autonomous local network, linked to the GeoGuard Cloud through a single point of external connection (GW). 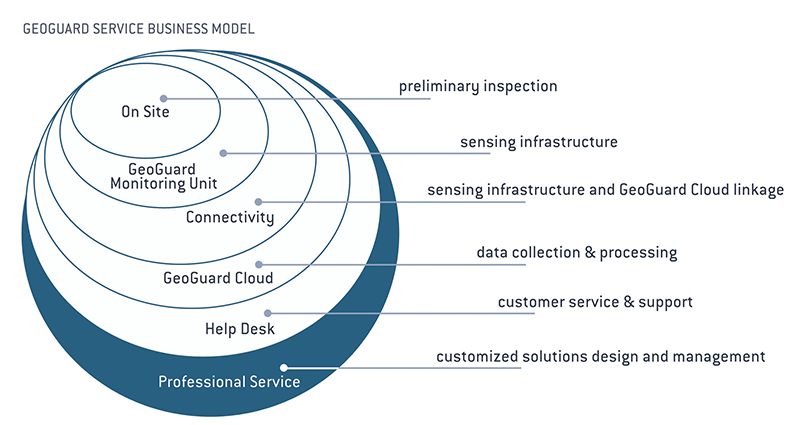 The core of the GeoGuard service receives and processes the data from the sensing infrastructure and provides point position time series, displacement and deformation information to the customer. a REST API allowing fast and easy integration of GeoGuard services into external management information systems. cultural heritage and large stadiums preservation.